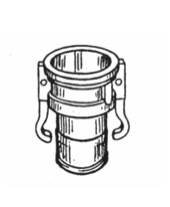 To join camlocks together one coupler and one adaptor are required. 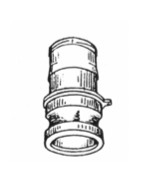 For these Ag camlocks there is a code that includes four numbers. The first two numbers identify the coupler or adaptor end size. The last two numbers identify the size of medium density pipe the hose tail fits. CAM7563S – joins 75mm and 63mm OD MDPE internally. Other sizes are also available – see catalogue. Metric (plastic) fittings can also be used, but may not be satisfactory if pipe is to be dragged. Use standard aluminium or polypropylene camlocks.